ACTION ALERT! NV Teabagger Candidate Sharron Angle in San Diego Tomorrow! I smell a protest coming on, don't you? Teabagger candidate Sharron Angle, who's running against Senate Majority Leader Harry Reid on the "let them eat cake" platform, will be the featured speaker for a San Diego fundraiser tomorrow. The "National Doctors Tea Party" (Who knew?) is hosting the event. 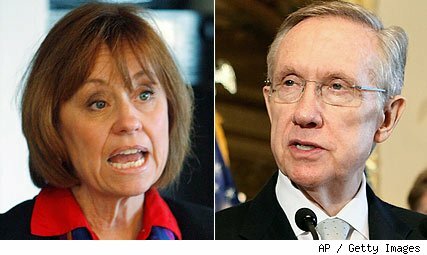 As GOP Senate nominee Sharron Angle attempts to parry charges from Harry Reid's campaign that she is "just too extreme," she is the headliner at an event Saturday promoted by a physician's group that is far out of the mainstream. The Association of American Physicians and Surgeons, which is a major promoter of the Doctors Tea Party in San Diego on Saturday, has given voice to some bizarre theories, believes the advent of Medicare in 1965 was "evil" and "immoral" and once published a piece arguing HIV may not cause AIDS. There's more, too, with the group promoting one of Angle's previously expressed theories that abortion may cause breast cancer and it also once argued the FDA is unconstitutional. And its journal once argued "there are real grounds for positively denying that HIV causes AIDS." So kids, if you're interested letting Angle know that you think what happens in Vegas should go the hell back there - or if you just want to learn how you can opt out of Medicare (and who doesn't) - here's the 411 on the rally. It's Official! Judge Rules Proposition 8 Unconstitutional! A federal judge in California has ruled that Prop 8 -- the voter initiative that banned gay marriage -- is unconstitutional, CNN and NYT are reporting. In a separate, unconfirmed report, CNN is reporting that Judge Walker issued a separate ruling granting a 2-day stay on the decision. Prop 8 supporters have already promised to file an appeal. The entire ruling can be seen here.